Special Cover on 30th All India Postal Basketball Tournament 2016-17 – 10th February 2017. 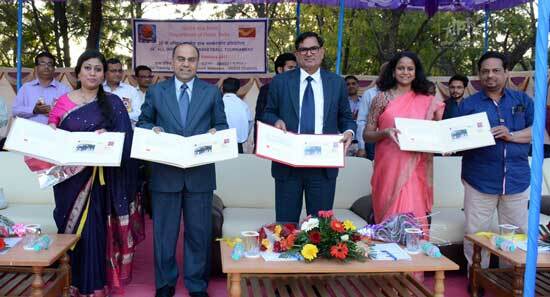 The Gujarat Circle Postal Sports Board hosted the 30th All India Postal Basketball Tournament 2016-17 from 7 to 10th February at the Postal Training Centre Basketball ground in Vadodara. Total six teams consisting of 85 players and officials from different parts of the country participated in the tournament. After a gap of nearly 13 years Vadodara hosted the Basketball Tournament. Basketball teams from Gujarat, Punjab, Haryana, Tamilnadu, West Bengal and Odisha participated in the Basketball championship tournament. Last year 29th All India Postal Basketball Tournament was held in Kolkata where West Bengal team was the champion. Basketball team of Odisha stood runner up and team of Gujarat came third. 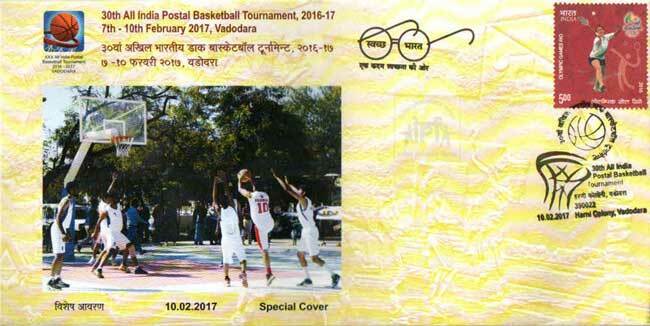 A Special Cover was released by Gujarat Postal Circle on 10th February 2017 to commemorate 30th All India Postal Basketball Tournament 2016-17 at Postal Training Centre, Vadodara by Chief Postmaster General, Gujarat Circle, Shri S. R. Meena, Postmaster General, Vadodara Region, Shri Vineet Mathur, Director, Postal Training Centre, Mrs. Suchita A. Joshi and Secretary, Baroda Philatelic Society, Timir R. Shah. Special Cover and Cancellation are designed by Shri Prashant Pandya.